Bless the Grass — and the Truth! the lies roll over it, and think that it is done. I wish Sara Thomsen had a YouTube Video of “god bless the grass,” but she does have a wonderful YouTube collection of other songs, and this one in particular will be one of my all-time favorites! A Woman’s Place … you will not regret taking a few minutes to view this! This entry was posted in Girls, Making change, Music, Social Issues and tagged Malvina Reynolds, Sara Thomsen, truth, women making change. Bookmark the permalink. 4 Responses to Bless the Grass — and the Truth! Speaking from a strictly male perspective – That video was amazing. I’d like to send this to my Aunt Sherry. She is one very powerful woman, who has endured a lot. It is not my place to go into detail about that, but I will say that she has had a lot of trials and triumphs. I came to your video in an odd manner: I post a lot on facebook – wanting to be recognized for my writing. I used to write articles on Mylot, but I could not seem to market myself well. In time, I realized that interest is a reciprocal thing. So, I decided to start commenting on OTHER people’s stuff. Not just anybody’s; just those who seemed to resonate with my feelings at that time. There’s this woman who has been leaving comments on my Status page; and finally, my curiosity got the better of me and I clicked on her name. In her own status page, she had a picture of some flower growing up through wood. It reminded me of flowers growing through concrete; and how phenomenal that little act is. 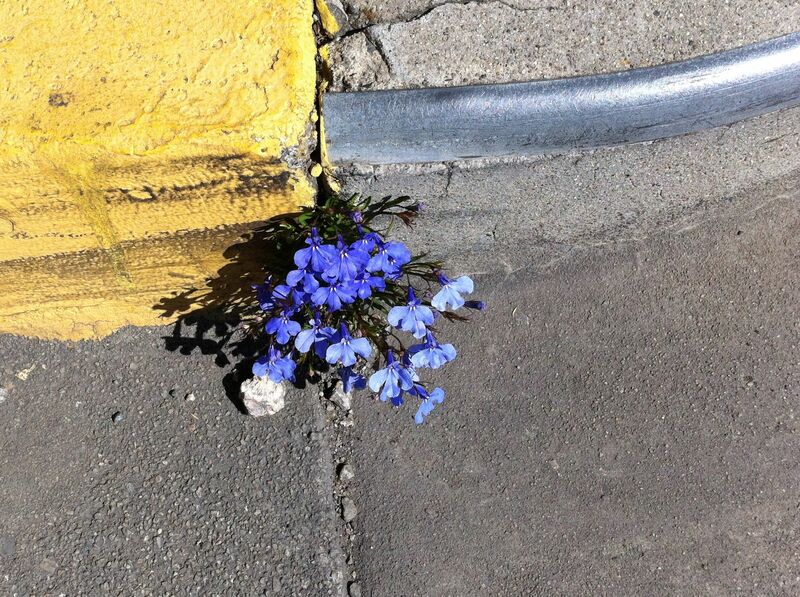 I wanted to try and post an image of flowers growing through concrete; and so I went to Google images. I had to surf Youtube to figure out how to download an image to my computer; and then to upload it to her status page where my comment was. I did that and came back and kept going through the Google images. Finally I hit upon an interesting one: Those blue flowers of yours. I clicked once more; and it brought me to this page. The caption or description of the video drew my attention; and so I clicked on the video to watch it and was glad that I did. It’s amazing how we’re so connected; and how little things can help us realize that again. OMG! That video is phenomenal! That was wonderful! I enjoyed it – thanks for sharing.